Today was the day I had been dreading for months- Nathaniel's first shots. It was inevitable, since I refuse to be the parent who doesn't vaccinate their child and puts everyone's children at risk, but it was a tough day nonetheless. We headed out to the pediatrician's office and my little boy was happy as a clam. He let the nurse weigh him and measure him, something I was eagerly anticipating as my arms are about to break every time I pick him up. Nathaniel is just shy of fifteen pounds and is 24 1/4 inches long. For his age, he is in the 95th percentile but he isn't disproportionate in any way; he's just a big little boy! It was a delayed reaction; after the nurse stuck the first shot, Nathaniel arched his back and screamed at the top of his lungs. I nearly started crying myself and I wanted to punch the poor nurse. You will all be happy to know that I restrained myself, since I didn't feel like going to jail today. 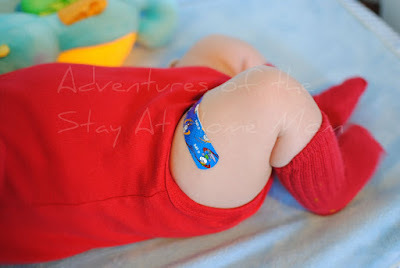 His band-aid on his little thigh is too adorable! shots are no fun, but i wish everyone would get their children vaccinated!! your son is so adorable! aw what a good little boy! congrats for getting thru it mama.